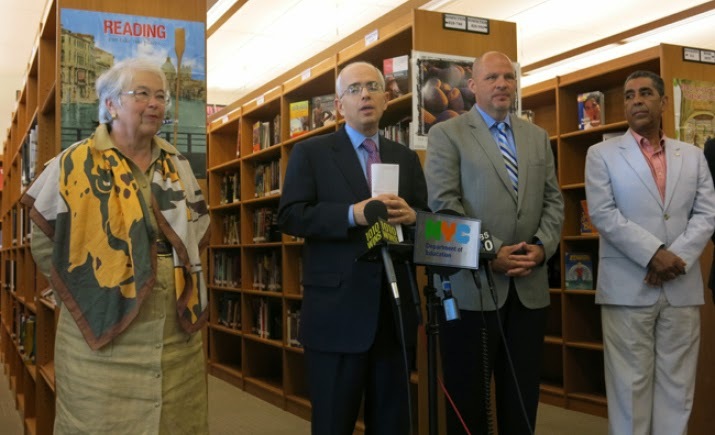 NEW YORK – Chancellor Carmen Fariña and UFT President Michael Mulgrew today announced the schools selected to participate in the Progressive Redesign Opportunity Schools for Excellence (PROSE) program for the 2014 – 15 school year. The PROSE program was established as part of the new contract between the UFT and the DOE to allow schools to implement innovative plans that fall outside of the Chancellor’s Regulations or UFT contract. All 62 schools voted to implement innovative plans as part of the PROSE program for the 2014 – 2015 school year. Staff members of these schools created a range of plans, including staggering the school day to meet student needs, changing contractually required student-to-teacher ratios to allow for a combination of small group learning and larger lecture-style classes, and using portfolios of instructional strategies to help rate teachers. In close collaboration with their teachers, school leaders in PROSE schools will drive continuous innovation as they look to change some of the basic rules and regulations under which they have historically operated. "Real change happens when educators are empowered to develop the best, tailored strategies to help their students succeed," said Schools Chancellor Carmen Farina. "At dozens of schools across the city, these educators have come forward with new, innovative practices that can serve as a guide for all of our school communities and brighten the classroom experience for every child." Chancellor Fariña, UFT President Mulgrew and First Deputy Mayor Shorris launched PROSE by inviting all public schools to submit a letter of intent indicating their interest in applying. Following the May 1 contract deal, 107 schools submitted proposals to be part of the program. All proposals were reviewed by a joint panel comprised of representatives from the DOE and UFT. Proposals were voted on by UFT staff in those schools, and proposals receiving 65% or more votes were approved. Ultimately, 62 were approved. The Department’s academic support teams will continue to work with these schools closely in the coming weeks to ensure that the proposals can be implemented successfully in a short time frame. Ensuring high quality learning environments is always the priority, and the Department will support these schools to make sure that any changes benefit teachers and students, and comply with all relevant State regulations. Community Health Academy of the Heights serves grades 6-12 and provides a wide range of social services for their students and families and voted to create a schedule to match the developmental and practical needs of individual students. The staff also voted to explore innovative food sourcing options for their students, including purchasing from local and sustainable vendors. “Community Health Academy of the Heights is excited to be a part of the PROSE initiative as it creates space for us to think outside of the box, try something new, something innovative, and ideas we have read about from colleagues throughout the US or internationally. The PROSE model gives us a chance, in a thoughtful way, to experiment with alternatives. We are excited to see the result of our new initiatives,” said Principal of Community Health Academy of the Heights, Mark House. This middle school serving high-need students in Brooklyn voted to provide more individualized attention, particularly for its at-risk students, by changing student-to-teacher ratios to create a balance of small group instruction with large lecture classes. “We are excited about this opportunity to create a learning environment which is flexible and which considers the best for our students and teachers. We anticipate a powerfully productive PROSE experience,” said Principal of the School of Integrated Learning, Monique Campbell. At this school for recently arrived immigrant students who are first-time learners of English, the staff is aspiring to make adjustments to the teacher evaluation system by developing a teacher portfolio that includes peer visits, formal observations, and professional development experiences—in essence a performance-based assessment system for teachers that mirrors the school’s innovative performance-based assessments for students. “We are happy to be a member of the PROSE program and believe that it will allow us to support our teachers in their efforts to innovate and hone their craft, thus providing additional opportunities and benefits to our students,” said Pamela Taranto, Principal of Brooklyn International High School. Deputy mayor, Anthony Shorris, announces 62 schools to participate in a program called PROSE. More than 60 schools have gotten the green light to innovate on such things as school schedules, student-teacher ratios or teacher evaluations under a new initiative established by the UFT contract. The 62 schools are the first selected for the new Progressive Redesign Opportunity Schools for Excellence or PROSE program, which gives teachers a real voice in decision-making to try strategies that vary from certain contract rules and Chancellor’s Regulations. After the UFT’s June 3rd contract ratification, 107 schools met tight deadlines to submit PROSE proposals put together by teachers, principals, parents and community leaders. A joint panel of UFT and DOE representatives reviewed all of the submissions and selected proposals based on the quality of the plans and whether they were the product of collaboration at the school levels. Proposals were then voted on by UFT staff in the schools, with only those approved by at least 65 percent winning selection to the program. At a third of the schools voting, the decision was unanimous in favor of the PROSE proposal. At half, 95 percent or more of staff approved the innovations. The vast majority had votes of 80 percent or more in favor. Among the selected schools, the plans include: changing student-teacher ratios to allow for a combination of small group instruction and lecture-style classes; setting a later starting time for high school students; and using teachers’ portfolios of instructional strategies in teacher evaluation. Mulgrew and Fariña praised the enthusiasm of teachers in the winning schools, noting that many spent their Saturdays working on the proposals. Rob Karp, chapter leader at the Community Health Academy of the Heights where the press conference was held, said his school’s PROSE plan is to set up three lunch periods instead of two to better accommodate the school’s 600 students in grades 6 through 12. Starting times will also change — to 8:45 a.m. for the school’s high school students and 8 a.m. for the middle school students. Students will have the same dismissal time marked by one bell, not many. THERE was the student who wanted to read Tolstoy, but abandoned “War and Peace” after a bewildering day with the Russian aristocracy. There were the students who had just come from Albania, to whom a Harry Potter novel was as inscrutable as Aramaic. There were the students who needed special attention, which I could barely offer. And then there were the ones who read quietly and would have welcomed a discussion about “The Chocolate War.” I couldn’t offer that, either. So went “independent reading” in my seventh-grade classroom in Flatbush, Brooklyn, during the 2005-06 school year, a mostly futile exercise mandated by administrators. On bad days, independent reading devolved into chaos. That was partly a result of my first-year incompetence, but even on good days, it proved a confounding amalgam of free period and frustrating abyss. This morass was never my students’ fault. A majority of them were poor, or immigrants, or both. The metropolis of marvelous libraries and bookstores was to them another country. To expect them to wade into a grade-appropriate text like “To Kill a Mockingbird” was unrealistic, even insulting. Writing instruction didn’t go much better. My seventh graders were urged to write memoirs, under the same guise of individualism that engendered independent reading. But while recollections of beach trips or departed felines are surely worthwhile, they don’t quite have the pedagogical value of a deep dive into sentence structure or a plain old vocab quiz. Now the approach that so frustrated me and my students is once again about to become the norm in New York City, as the new schools chancellor, Carmen Fariña, has announced plans to reinstate a “balanced literacy” approach in English classrooms. The concept’s most vociferous champion is probably Lucy Calkins, a Columbia University scholar. In her 1985 book, “The Art of Teaching Writing,” she complained that most English teachers “don’t know what it is to read favorite passages aloud to a friend or to swap ideas about an author.” She sought a reimagination of the English teacher’s role: “Teaching writing must become more like coaching a sport and less like presenting information,” a joyful exploration unhindered by despotic traffic cops. Ms. Calkins’s approach was tried by Mayor Michael R. Bloomberg, but abandoned when studies showed that students learned better with more instruction. My own limited experience leads me to the same conclusion. 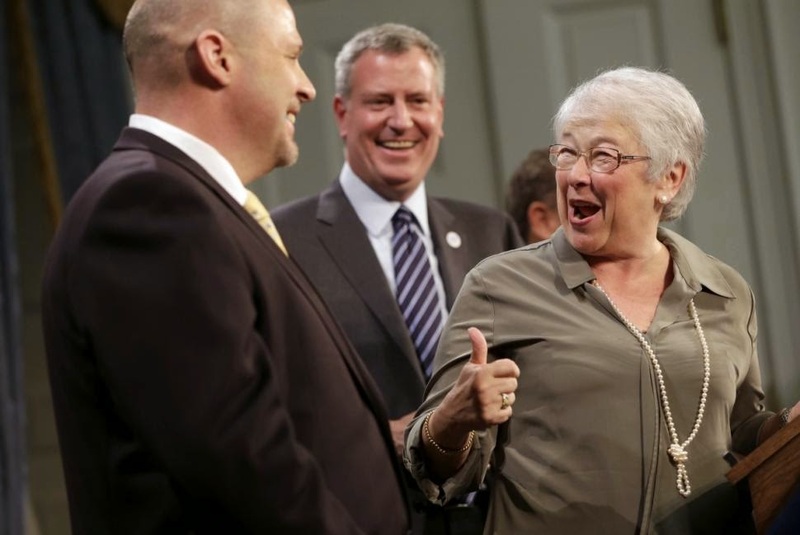 But Ms. Fariña seems to be charting a course away from the data-driven Bloomberg years, perhaps as part of her stated plan to return “joy” to the city’s classrooms. I take umbrage at the notion that muscular teaching is joyless. There was little joy in the seventh-grade classroom I ran under “balanced literacy,” and less purpose. My students craved instruction far more than freedom. Expecting children to independently discover the rules of written language is like expecting them to independently discover the rules of differential calculus. Balanced literacy is an especially irresponsible approach, given that New York State has adopted the federal Common Core standards, which skew toward a narrowly proscribed list of texts, many of them nonfiction. Ms. Calkins is a detractor of Common Core; Ms. Fariña isn’t, thus far, but her support of balanced literacy sends a mixed signal. I am somewhat prejudiced on this issue, for my acclimation to the English language had nothing balanced about it. Yanked out of the Soviet Union at 10, I landed in suburban Connecticut in the English-as-a-second-language classroom of Mrs. Cohen. She taught me the language in the most conventionally rigorous manner, acutely aware that I couldn’t do much until I knew the difference between a subject and a verb. Mrs. Cohen was unbalanced in the best possible way. Two decades later, I became a teacher because it seemed a social good to transmit the valuable stuff I’d learned from Mrs. Cohen and other teachers to young people who were as clueless as I had been. After leaving the middle school in Flatbush, I went to a selective high school in Bushwick, where I taught Sophocles while rhapsodizing about semicolons and gleefully announcing vocab quizzes. My students were seeing the beams that support the language; they went on to write poems, papers, newspaper articles and personal essays that earned a number of them admission to the nation’s best colleges. If any of it was soul-crushing, I missed the cues. The fatal flaw of balanced literacy is that it is least able to help students who most need it. It plays well in brownstone Brooklyn, where children have enrichment coming out of their noses, and may be more “ready” for balanced literacy than children without such advantages. My concern is for the nearly 40 percent of New York City schoolchildren who won’t graduate from high school, the majority of whom are black and brown and indigent. Their educations should never be a joyless grind. But asking them to become subjects in an experiment in progressive education is an injustice they don’t deserve.